One of my favourite foods to bring home from a destination is cheese. 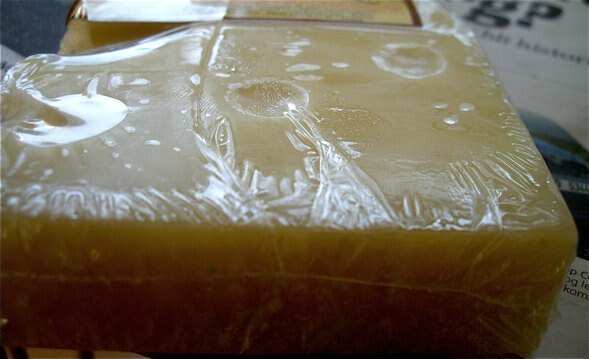 If you have a long journey in front of you, it is wise to choose a mature semi-hard or hard cheese, as soft cheese may melt during transportation. That is why I chose two Swiss cheeses, when visiting the local Carrefour supermarket in Ferney-Voltaire in France. Emmenthal is actually synonymous with Swiss cheese. It is semi-hard with a sweet, nutty aroma. It is a perfect choice as hard cheese on a platter but is also a good cheese for quiches or omelettes. It originates from the Emme valley outside Bern, but is now produced in France as well. 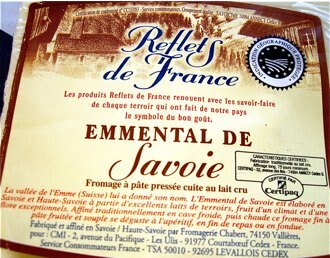 This "Reflet de France" is a store brand created by the Carrefour supermarkets as specialties from different French Regions. The Emmenthal is a protected name reserved for the Franco-Swiss border region. This particular cheese is manufactured in Vallieres west of Annecy in France, an hours drive away from Geneva. 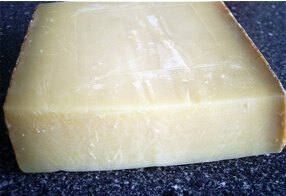 Gruyere originates from the region of Gruyere in the French speaking Canton of Fribourg. It is produced on licence throughout Switzerland by a large number of dairies. It is structurally very different from the Swiss cheese as it has no holes, but a young Gruyere has much the same sweet nut aromas as the Emmenthal, but a fully matured cheese (up to one year) tends to develop much more complicated aromas. This post contains information on products or specific brands. Our staff will ensure our readers that we have no commercial interests in, or are paid to promote these or other products, brands, or labels.